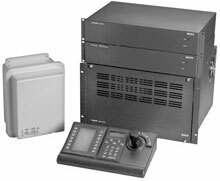 The Video Interconnect Panel provides the LTC 8200, LTC 8300 Series, LTC 8600 Series, and LTC 8800 Series systems the ability of looping up to 32 video inputs per panel. The Bosch Video Interconnect Panel systems feature the ability to loop up to 32 video inputs per panel. This 'patch' panel contains 32 BNC connectors on its front panel for external video connections and two 16-contact ribbon connectors on its rear panel. Two, 2-meter (6-ft) 16 conductor video grade ribbon cables are included for interfacing the patch panel to the video looping connectors on the rear panel of the LTC 8200, LTC 8300 Series, LTC 8600 Series, and LTC 8800 Series equipment bays. The Bosch LTC 8808/00 is also known as BOS-LTC880800	or LTC880800	.